It was a lovely sunny and warm Sunday, so I got to wear another of my DFO summer purchases! Paired the navy skirt with pink accessories of course. I do like pink and blue together. Went with silver sandals instead of pink ones though, as I didn't want to go too overboard with the pink. What do you think? 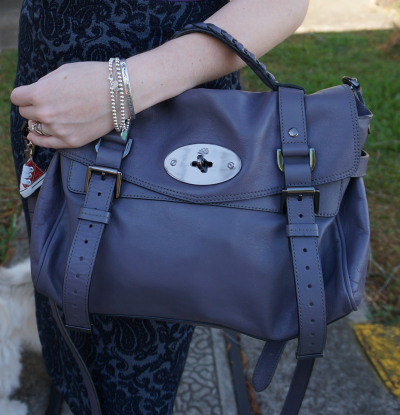 Last worn: blue sunnies, grey tank, Roxy skirt, silver sandals, Marc by Marc Jacobs Karlie bag. Managed to forgot my sunglasses today, and a blazer I'd set out to cover up the casual tee for a meeting I was hosting in the afternoon. Luckily I always have a cardi in the office, so threw that over the top of this to seem a little less casual. Linking up with My Style Monday, Style Sessions, Trend Spin Linkup today. 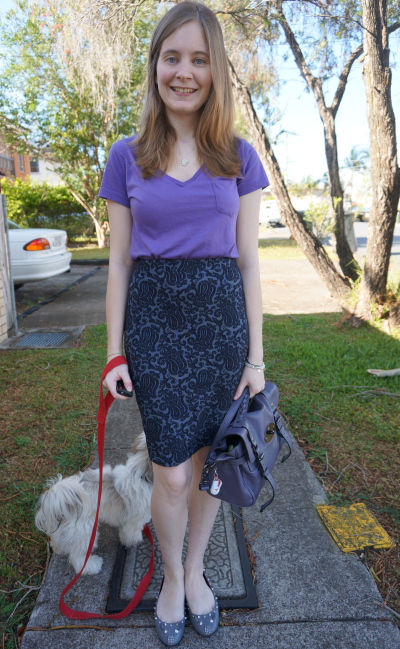 Last worn: purple tee, jacquard pencil skirt, MbMJ studded mouse flats, Mulberry foggy grey Alexa. You always seem to have the best work outfits - the skirt is so pretty! The paisley print is so interesting! what a cute succulent skirt! and love the pink purse! It's spring here! Although lately it's been quite cold and rainy again, after a bit of an early summer. Looking gorgeous as usual Mica! I love how laid back and casual you look in the first outfit. And I also really love the barroque print of your skirt in the second outfit! Adorable skirts! I love your fun bracelets in the first outfit post, too. Both of these skirts are beautiful! I'm really quite jealous of your bare legs! I'm back to tights and boots in Melbourne! Back to tights here again now too, funny the difference a week makes! Was looking forward to a warm spring too! The tank and blue floral skirt are so cute and summery...we're expecting some snow this week...bleck! haha, to be honest, I only started embracing skirts and dresses after my first proper office job where I wasn't allowed to wear jeans :P Otherwise I would still be getting frequent wear out of all the jeans and tees in my wardrobe! Skirts just grow on you...eventually. Totally loving both of those skirts! I love this style ;) you look fabulous! I love both of your skirts and the way you paired the second skirt with purple is so stunning. the flower skirt is so darling! also love those house of harlow bracelets! i think the pops of pink work well with navy. Cute outfit. Your dog is adorable! love the hot pink bag!! wow!! can't believe the weather there is still permitting you to wear summer outfits!!! lovely colours, dear! You are just too adorable! Visiting from Style Elixir.